Icicles are often a warning sign of ice build up that can cause roof leaks and shingle damage. Although snow build up on the roof and icicles are often seen as just a part of winter, they could be causing damaging ice dams on your roof. Ice damming can cause problems like water leaking into the attic, which could soak the wood, insulation, flooring, or upstairs ceiling, as well as belongings stored in the attic. 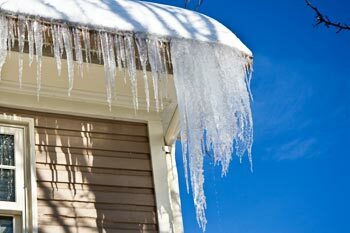 Ice dams can also ruin gutters and damage roof shingles. Dr. Energy Saver can prevent this from happening by sealing air leaks and improving attic insulation in your home. If you're concerned about ice dams in your home, call us today to get an inspection and estimate on our insulation solutions. Ice dams are essentially the product of melting and re-freezing snow. Snow accumulation on the roof is obviously the first step, and the deeper the snow, the more severe the problem is likely to be. Heat that leaks into the attic from the living space below warms the roof surface, and causes snow to melt. This melting process doesn't happen evenly or uniformly because some parts of the roof will be warmer than others. Once the snow begins to melt, the water will naturally run down towards the gutters. However, the roof will always be coldest along its edge because this part of the roof projects beyond the exterior walls, where heat from the house isn't available. Once the water reaches the roof edge, it freezes and forms an ice dam. Sometimes water freezes in the gutters, filling the gutters with ice. In other situations, the water freezes right at the edge of the roof, before it reaches the gutters. Either way, the resulting ridge of ice forms a dam that creates a reservoir of water as more snow melts. When this happens, it's only a matter of time before the water seeps beneath roof shingles and leaks into the attic. See how Dr. Energy Saver can eliminate ice damming problems in your home. How do you eliminate ice dams in your home? The simple answer is to keep the roof surface cold so that snow won't melt until the exterior temperature causes it. In order to accomplish this goal, Dr. Energy Saver will air seal and insulate your attic ceiling. Most houses have inadequate attic insulation and an abundance of air leaks that allow conditioned air from the living space to escape into the attic. We generally use one of two options. First, we can use spray foam insulation, which air seals and insulates simultaneously to keep warm air inside the home. The second option is to air seal the attic first with special sealant, then install rigid foam insulation with a radiant barrier. Both methods will serve to eliminate heat loss through your roof. If you've dealt with ice dams in your home, Dr. Energy Saver is here to help. Our experienced professionals will carefully examine your home and recommend the best insulation solutions for your problems. Call us today to set up an inspection and estimate with your local dealer!